Southern's 73202 had a special outing on 4th October when it made one of it's longest runs for a good number of years. The former Gatwick Express locomotive, more recently used in connection with the Southern / Gatwick Express class 442 fleet was utilised to move some of the final 'Wessex' units off the Southern patch to Bournemouth where they are currently being assessed for their return to traffic with South Western Railway. On Mondy 3rd 73202 moved some units between Selhurst and Brighton Lovers Walk Depot before transporting 2408 and 2402 through to Bournemouth (via Poole). This is through to have been the first appearance of the Southern liveried class 73 away from it's home patch since it was re-painted several years ago at St Leonards. 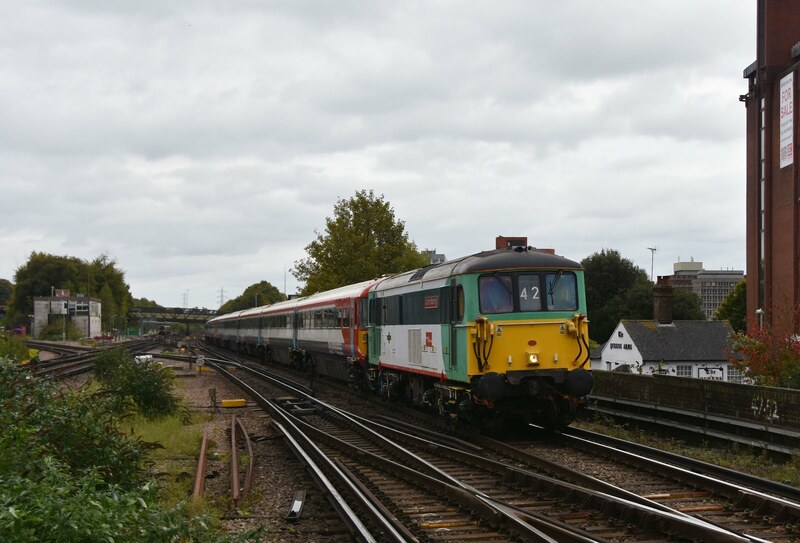 With the final 442's leaving Southern the following week under their own power to Bournemouth it remains to see what future will bestow 73202.